This is just a heads up to you guys because I am going to write a full report on the lawless nightmare that erupted on my street after Saturday night’s OSA concert. I am going to cc everyone from our community meetings, all of OSA, Lentol’s office, to Schumer’s office, the mayor’s office, the police community affairs officers, and the media. I am going to blast OSA for creating this situation which represents only a fraction of what we have been going through for the last 3 years. So keep your eyes open later for my full email. All I can say is… WOW! When I get a full account of what happened I will add it here. Incredible… Here you go! This is an open letter to the Open Space Alliance, the residents of Williamsburg, our elected officials and the press. On Saturday night, September 17, 2011 between approximately 9:40 PM and 10:20 PM the following events took place on North 7th Street off the corner of Kent Avenue in Williamsburg, Brooklyn after the crowds let out of the concert produced by the Open Space Alliance / OSA, which was held in the East River State Park. At about 9:40 PM the noise from the concert in the East River State Park had finally ended. So I was about to try to get some video editing work done on my computer when my attention was drawn to loud popping sounds, sounds of gas rushing and the roar of large crowd outside on the street. When I looked out my front window I was horrified to see a huge mob collecting. A group of nitrous oxide balloon sellers had assembled next to a dumpster across the street. Hundreds of people, if not more, were gathering up and down the block buying balloons filled with the gas and inhaling them. Concert-goers already drunk from the East River State Park were becoming even more highly intoxicated from the nitrous oxide. They were wandering around like zombies holding fists full of balloons. There was not ONE SINGLE COP to be seen anywhere. I called 911 and explained what was taking place. The 911 operator was having difficulty understand the situation so I gave him the location and pleaded, ‘Just send the police now. We need help here!’, and hung up. Then I grabbed my camera and stepped out on my stoop. It was a horror show. Afraid for my safety while filming on my stoop, I used my heel to keep the door open behind me just in case I had to escape. In one of the last clips you can see a couple of men coming toward me in a menacing way. I shot the first video of the scene unfolding on my street– seen here. At the end of that clip I kept rolling as I headed down to the corner to try to find a cop. There are nine videos which can be seen here. Desperate to find help, I ran without shoes down to the lone cop who was directing the very chaotic street and pedestrian traffic on Kent Avenue and N. 7th Street. I pleaded with him to send help because a huge mob had grown around the nitrous oxide balloon sellers. He had no idea what was going on. It was dark he couldn’t see up the block, it was noisy and he clearly had too much to deal with on his own. After pleading further, he finally seemed to get that I was serious. He said that he would and gave me the impression that he would call for help. But no one came. The mayhem went on unabated for nearly half an hour. No police came. Not one. Inexplicably, after about 20 minutes firemen were sent to clear the mob. Many concerned members of the community have attended months of tedious and fruitless community meetings with Stephanie Thayer, Executive Director of the Open Space Alliance and other people from that organization. They claim they want to try to fix the problems with these concerts. Time after time they offer the most minor of concessions and it never makes a difference. But, there is no ‘fix’. The truth is that OSA’s concerts do not belong here and they have abused us long enough. These concerts have proven to be completely unmanageable in terms of community quality of life impact—the noise, disturbance, crowds, garbage, crime and so on. I speak for many when I say that we are sick and tired of our legitimate concerns constantly being downplayed and marginalized again and again. OSA is completely responsible for this horror show. But now they can no longer sweep it under the rug. These videos represent only a fraction of what we have been going through for the last 3 years. No one petitioned OSA to bring stadium-sized outdoor events to our area. All of this is forced upon us. I have lived in NYC my entire life in some of the worst drug neighborhoods; the Lower East Side in the 60s, Spanish Harlem in the 70s and the Southside of Williamsburg in the 80s and I have never seen anything like this before. And that is saying a lot. Worse still, is the fact that the band playing that night, ‘Widespread Panic,’ is known for its followers who are heavily into nitrous oxide. So much so that their official website’s FAQ section contains a specific warning about nitrous oxide. Seen here. I invite and encourage you all to please look carefully at each and every one of the videos to see for yourselves what happened. And remember, it was 100 times worse to experience in person. UPDATE, September 20, 2011: Apparently the band featured on the evening in question was (amusingly enough) “Widespread Panic”. 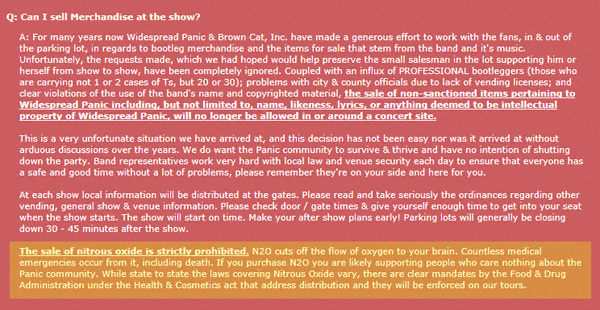 Curiously enough, it would appear that the sale/use of nitrous oxide at Widespread Panic’s concerts has been an issue before. Why else— may I ask— would they have a caveat about this on their website’s FAQ page? Many OSA board members were once very respected in this community. Can’t imagine what the status is now. I find it fascinating that this organization has taken great pains to throw Jelly NYC under the bus regarding poor event handling, being a nuisance to the community, etc. Excuse me, but WTF is this? How is it that not one of the THIRTY FIVE cops on duty for this event could be summoned by the 911 call or were anywhere in sight? Seems like it would be kind of hard to miss 35 cops or for 35 cops to miss this. Perhaps the laughing gas rendered them invisible? It’s common knowledge that drugs are prevalent among jam band gigs like Furthur, Bonaroo, etc (see here: http://www.newjerseynewsroom.com/movies/phish-fans-continue-history-of-drug-arrests). If OSA is going to invite these types of acts to play, they should at least beef up security accordingly. Pathetic on the part of OSA, and I sympathize with residents in the area that have to endure this every year. Nice. Really nice. And to think they cancelled the “Latino show” because they felt it was the most likely to create problems! “I have lived in NYC my entire life in some of the worst drug neighborhoods; the Lower East Side in the 60s, Spanish Harlem in the 70s and the Southside of Williamsburg in the 80s and I have never seen anything like this before. Lady, either you are a blatant liar about your experience in nyc history or you have seriously grown out of the new york lifestyle. Either way, you should evaluate your placement in this community. I’m not condoning the act of the concert goers but to call a crowd of people huffing nitrous before 11pm a horror show is the response one would receive from a mother of four in a town with a population of one thousand in Alabama. If at some point you assumed that living on the fancy water way of dilettante-burg was going to be easy breezy without any organization trying to make money off the scenic location then you should have opted for the nice apt in Carroll Gardens, the Chicago of Brooklyn. It’s beautiful, conservative and quiet. Pushing against the grain is admirable in most cases. This isn’t one of them.